Years ago, a fire destroyed the basement of the opera house. Click here to play! It is said that a patron who died in the blaze still haunts the theatre. Justine, the lead singer, needs your help in solving this phantom's mystery so that he will leave her alone. Solve this mystery and you're likely to uncover a huge fortune. Scour the theatre for the Phantom's Mask. It is likely to lead you to his ghost, but more likely to lead you to loads of cash as it not only acts as a substitute icon, but doubles all prize money when it appears in winning combinations. If you spin between two and five of his sheet music icons, you'll be paid out up to 5000 times your original line bet. Spin two to five Justines and you'll get 1000 times your bet. Both roses and mirrors also pay off handsomely if you can collect two to five of each. If you're lucky enough to spin a letter on reel 1 and a mask on reel 5, you'll trigger the bonus game in which you will be rewarded five free games. These free games will triple your prize money and see the phantom making appearances on reel 3. 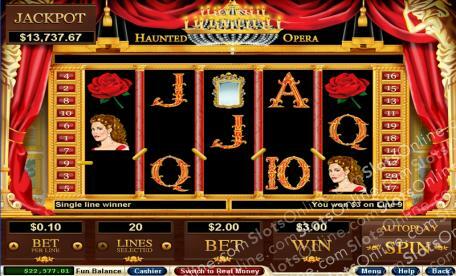 Scour the Haunted Opera tonight to find the phantom and collect a load of cash. Two or more letters from the phantom anywhere on the board will pay out up to 100 times your total bet. A feature is triggered when you get a letter on reel 1 and a mask on reel 5. You will be rewarded with free games. If a phantom appears on reel 3 during your free games, you will be rewarded with three extra free games. Prizes are tripled during free games. The Phantom's ghostly mask substitutes for all other symbols excluding the scatters. Prizes are doubled when a phantom mask appears in a winning combination.